A vibrant, affecting collection of first-person accounts of those’some well known, some not—who fled Nazi Germany to find refuge in America. Anderson, chair of Columbia University’s Department of Germanic Studies, has gathered over three dozen distinct personal stories and musings on the plight of German-speaking exiles from Hitler’s tyranny. Despite the diverse circumstances and personalities presented here, certain themes emerge. 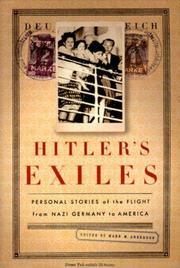 These included the sheer disbelief among Germany’s Jews that Hitler’s reign could be more than a brief interlude and that any flight abroad would involve more than a short trip. As Alfred Doblin writes, “You'll let the storm pass over you, just three or four months, and the Nazis will be gone.” And even after Jews were being denounced as scoundrels and vermin and the ruin of the German people, many Jews still felt strong allegiance to Germany and found it difficult to leave their “beloved homeland.” As Marta Appel testifies, “Hatred and persecution could not destroy the love we felt for our homeland.” The mounting enthusiasm, in fact, that many young people felt for Palestine was a cause for tension among parents and children in many German Jewish households. Once in America, Hitler’s exiles (having lost just about everything they ever owned) felt forced to forget the past so that they could master an uncertain future. As Hannah Arendt records, “In order to forget more efficiently we avoid any allusion to the concentration camps or internment camps we experienced in nearly all European countries—it might be interpreted as pessimism or lack of confidence in the new homeland.” And with this unwillingness to confront their recent trauma came a multitude of psychological and emotional issues that impacted the next generation. A fascinating portrait of lives left behind and re-created.